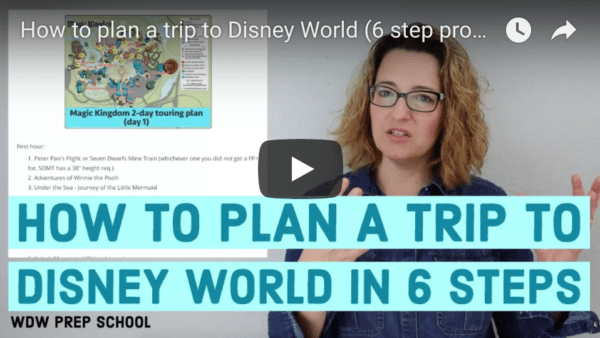 All the extra challenges might make you think it would be crazy to attempt a trip to Walt Disney World with toddlers, but it really shouldn't. One of the best things you can do while kids are still young is to plan a trip based on what they are into. Though the days may seem long with toddlers, the phase passes quickly and before you know it, they are doing all of the grown up things in the parks. How many days to spend in each park? What to do about strollers? When traveling with a toddler, when should you drive and when should you leave the driving to Disney? What height requirements affect toddlers? How do I discipline while at Disney World? While waiting to go to Disney World with toddlers, it's good to get your little one involved so they can get excited and know what to expect. One dilemma for parents of little ones is knowing how far ahead to tell them because every day could become "when are we leaving? are we leaving now? how about now?" You might want to talk about Disney World (the rides, the hotels, etc.) but without telling your child that a trip is planned. That way they know what Disney World is and what you can do there, but can't nag daily asking if it's time to go yet. You could decide to tell your child just before the trip begins and use a fun countdown to count down the final days before your trip. Depending on your child's age you might want to keep the countdown short (10 or fewer days). Follow Shannon, WDW Prep School's board Counting down to Disney World trips on Pinterest. There are a lot of things you can watch to get your toddler prepped and excited. 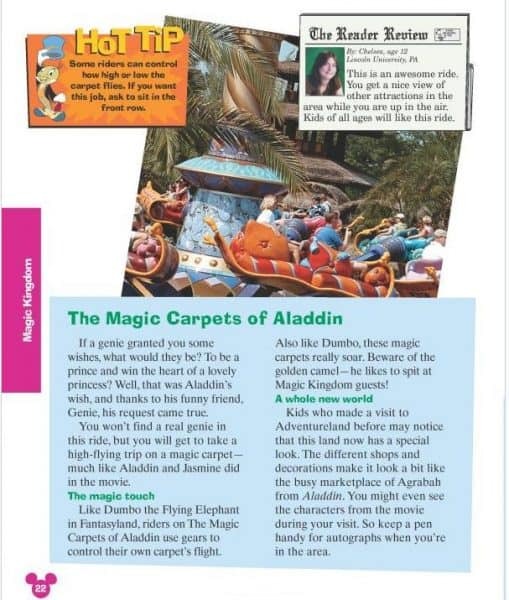 Although toddlers can't read yet, the Birnbaum's Walt Disney World for Kids book is great for all ages. It has big pictures and ratings by kids to give you an idea about what kids will like. If this is going to be your first time in a plane or on a long distance road trip, you might also consider reading books about flying or traveling by cars. Trip itineraries are great for helping kids know what to expect. For little ones, that means using more pictures than words to show the daily plans. Check out the itinerary templates to put together your own. When choosing an on-site hotel that your toddler will love, you might want to look in the Value and Deluxe categories. Moderate theming is beautiful, just not super toddler-friendly. For Values, Pop Century and Art of Animation are our top recommendations. Art of Animation is especially fun (and maybe worth the extra $$$ compared to other value resorts) if your toddler happens to be really into Finding Nemo, Cars, The Lion King or Little Mermaid. As a bonus, most of the rooms at Art of Animation (all of them except for the Little Mermaid rooms) are suites, allowing you to have separate rooms, 2 bathrooms, and a kitchenette which could be really handy (and the suites allow up to 6 people - a rarity when staying on-site). Pop Century is another great option. Unlike the All Star Resorts, Pop Century doesn't share its transportation with any other resorts. This is a nice bonus when you're trying to get a sleeping toddler back to your resort. Rooms at Pop Century were recently refurbished and the new layout likely appeals to many families. The standard rooms at Pop Century all have queen-sized beds, one of which is a Murphy Bed that folds down from the wall. Many guests have reported that they really like the ability of being able to fold the one bed up when it isn't in use because it gives them more floor space, which is nice if you have little ones that need some room to play. Another nice feature of the refurbished rooms is a sliding door between the sink area of the bathroom and the sleeping space. This makes it a lot easier for people to get ready in the morning without disturbing those that might still be sleeping. If you are considering a Deluxe Resort, you can't beat staying at The Polynesian with toddlers. It's super easy to catch the monorail right at the hotel to Magic Kingdom, just a short walk to the monorail to Epcot, and it's in a location where you can view Magic Kingdom fireworks from your hotel (which is nice if your little one likes the look of fireworks but not the sound). 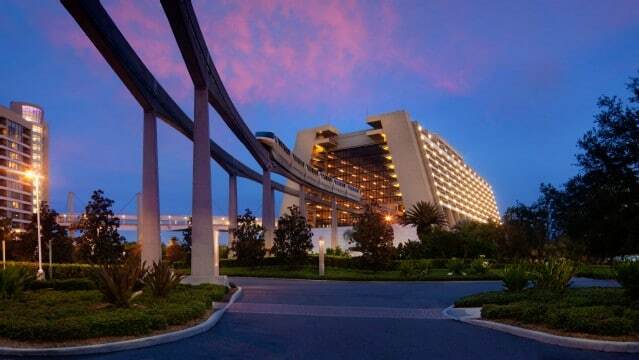 The Contemporary Resort is another Deluxe worth considering. With the monorail going right through the building and the ability to walk to Magic Kingdom, it's hard to imagine it not being fun for anyone, especially families with little ones. It also has Chef Mickey's restaurant located right inside - a popular choice for families at Disney World. With all the families traveling to Walt Disney World, Disney is prepared when it comes to beds. To help make bedtime easier, Disney has both bed rails and Pack 'n' Plays available to borrow. You can request one when you get there or, even better, you can call (407) 934-7639 to have the request added to your reservation. Before getting into the specifics of each park, let's talk about some general park touring advice first. Step 3 in the 6-step process is to make a daily plan. That includes deciding how many days to spend in each park. It's really hard to tell people how they should spend their days, but here's some advice and you can adjust based on your family. For people who want a toddler-focused trip, this is how you might want to split up your days. For a 3 day trip, do 2 days at Magic Kingdom and then either Hollywood Studios or Animal Kingdom. For a 4 day trip, do 2 days at Magic Kingdom, 1 day at Hollywood Studios and 1 day at Animal Kingdom. For a 5 day trip, do 2 days at Magic Kingdom, 1 day at Hollywood Studios, 1 day at Animal Kingdom and 1 day at Epcot. For a 6+ day trip, do the same as a 5 day trip but with a break day (or days) in the middle to rest at the hotel, visit Disney Springs, swim, etc. Traveling with a toddler usually means you'll be packing some extra stuff. stain stick or Shout wipes, etc. 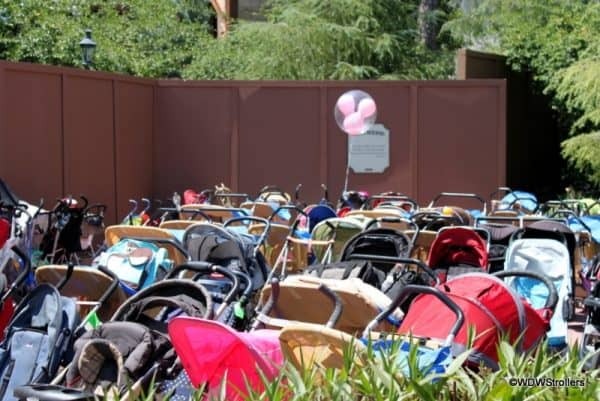 Your toddler may not use a stroller any more, but they will very, very likely need one at Disney World (unless they're ultra toddler marathoners who can go 10+ miles per day). Strollers are very handy for not only providing your little one with a spot to rest their feet, but they also provide a place for you to store some of that extra stuff toddlers need. You'll have lots of options when it comes to strollers - renting offsite, renting from Disney, bringing one from home, shipping a new stroller to yourself, etc. Be sure to read our comparison of stroller options to decide how you will want to handle strollers for your trip. 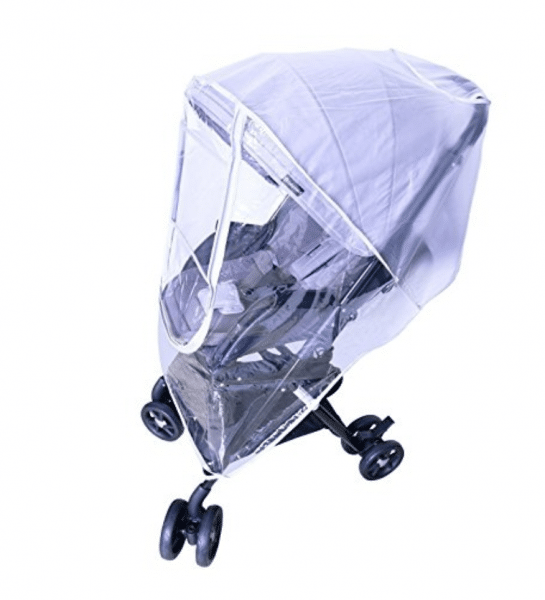 Whatever stroller you decide to use we highly recommend you also consider bringing along, renting, or purchasing a rain cover. Going when the temperatures are predicted to be hot? If you're using a stroller, you'll likely want one of these stroller fans, too. When visiting Disney World and staying onsite you'll have access to lots of different transportation options. 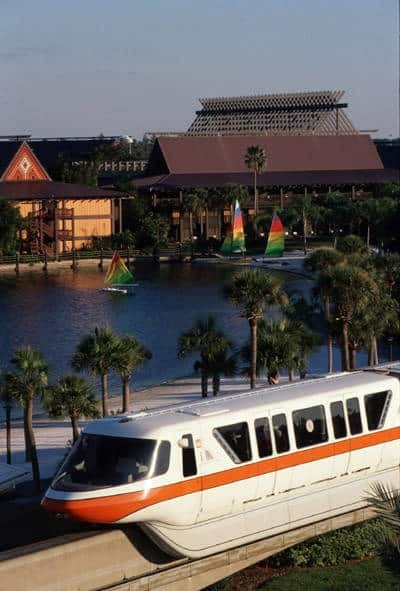 The monorail, buses, and boats are all free to use and can be a fantastic choice for many families. If you have your own car, however, sometimes it might make more sense to drive than it does to use Disney's bus transportation. When you drive your own car at Disney World, you are guaranteed that everybody in your group will have a seat. With the buses in particular, that isn't always the case. During busy times like mornings and evenings, you might find that some people in your party will need to stand and that can be tricky if you have little ones. One thing to keep in mind, however, is that recent Walt Disney World parking changes means you'll pay to park at your resort, so make sure you factor that into your budget when weighing all the pros and cons. Disney also offers a premium transportation option called Minnie Vans. 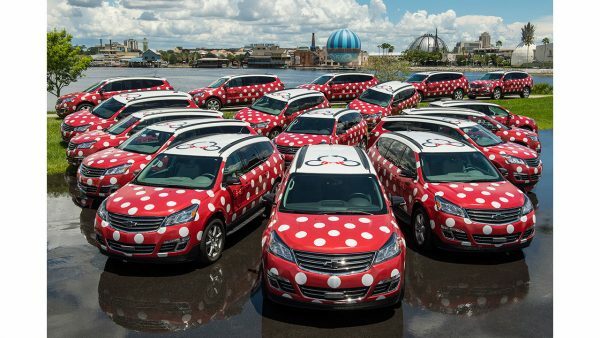 These adorable polka-dotted vehicles operate much like Uber or Lyft, but are driven by Disney Cast Members and come equipped with convertible car/booster seats. If you are running short on time or are planning to go from resort to resort (like for a dining reservation), Minnie Vans are your fastest option. They are pricey ($25-$45 per ride, depending on distance), but they can really cut down on the stress. Some transportation options allow your little one to remain in the stroller, but most do not. Buses and trams - strollers must be folded up. Even if your little one is sleeping and the bus is totally empty, you'll still need to fold your stroller. 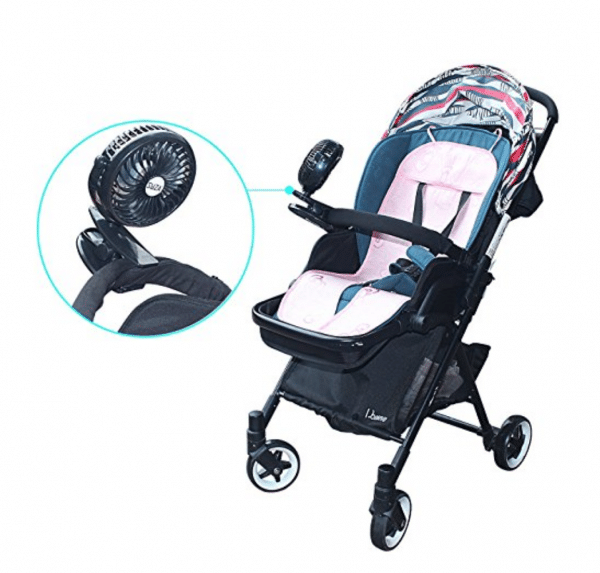 Folding and unfolding a stroller multiple times can be a hassle, especially at the end of the day when all your stuff has multiplied. Because of that, whenever possible, we recommend that you choose the mode of transportation that allows you to minimize all the folding and unfolding. If buses are your only transportation option, just make sure you are prepared to fold up your stroller before you board. Having an extra empty bag you can toss things into can make that process easier and less stressful. If you have a car available and you plan on getting to the parks at least 45 minutes before they open, we recommend driving. Guests that arrive in plenty of time for Rope Drop often park close enough to the front of the park that they can walk to the entrance without using a tram. Since this trip plan is focused on little ones, the thrill rides (which all have height requirements) aren't included in our touring plans for families with little ones. However, there are a few non-thrillers that also have height requirements, and those are indicated on each of the touring plans. 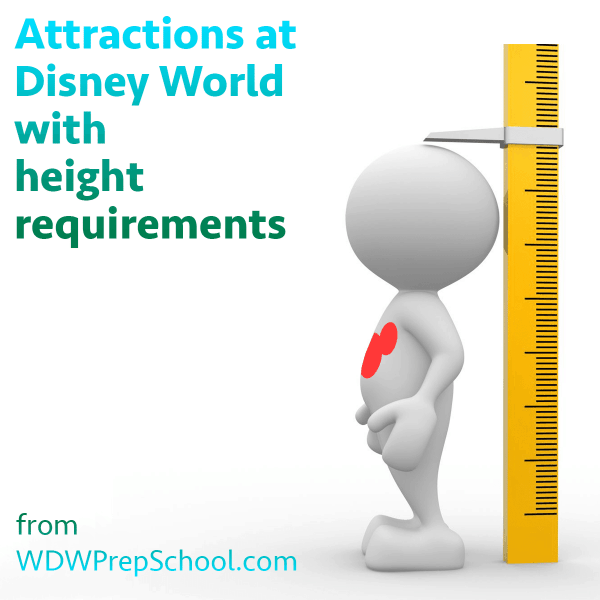 You can also check out the overview of attractions with height requirements for a complete list. Although each of the touring plans is focused on doing just things that toddlers would like to do, adults may still want to enjoy some of the bigger rides as well. Disney provides a perk called Rider Switch which allows adults to take turns riding which can help you do that. Ahhh, that nasty subject that comes up a lot with toddlers. Believe it or not, they will not magically be perfectly behaved at Disney World so you'll need to plan ahead. Prevention is sooo important. Ideally the more you can prevent the things that cause meltdowns the more you'll be able to avoid needing to discipline. Don't overdo it. Unless your little one is used to going non-stop don't try to go from sunup to sundown. Schedule lots of down time and allow them to just do their own version of relaxing. Being overstimulated is a common reason for meltdowns in people of all ages - including toddlers. Make sure they aren't hungry. Being "hangry" is a real thing, and when your toddler gets hungry, you may see that manifest in bad behavior. Be proactive and ready with snacks to help avoid situations where an empty stomach causes a meltdown. You can bring food and drinks with you into the parks (just no alcohol or glass containers) which makes it very easy to always have your child's favorites with you. Allow everybody enough time to sleep. Even adults could use a nap daily at Disney World. The heat, extra activity, and excitement wears you out. Be sure you allow everybody the opportunity to get the sleep they need which sometimes may mean early nights or sleeping in. Try to limit lines as much possible. Our touring plans are optimized to keep you moving and out of lines. Whenever possible, try to make sure you stick to those to help avoid long waits. Prepare for the weather. Weather extremes can make even the most pleasant of people cranky. Be it rain or heat or cold, make sure you know what to expect when you go and how to handle the weather when you are there. Try to stick to routines. Even adults like routines, and toddlers are especially sensitive to changes in theirs. Whenever possible, try to make sure you'll have the necessary items to keep major routines in place. Things like having a special blanket or pillowcase from home can help at bedtime, and familiar snacks (and snack times) can also help keep everybody smiling. If you don't want to worry about packing all your favorites, you can order groceries and snacks for when you are there. If you have little ones still in diapers or Pull Ups, you can also order those supplies as well. Leave if necessary. At home, you might be willing to leave places if your toddler starts acting up, but at Disney World...that's not so easy. It's difficult to leave a park and get back to your hotel room. It often takes an hour and includes a lot of waiting. That's really hard to do with a toddler in meltdown mode. Instead, you might want to consider "leaving" in a different way - leave the line you're in (or the gift shop you're shopping at or whatever it is), and head somewhere more private for a little downtime. You can head to a restroom, a quiet bench out of the way, or even one of the Baby Care Centers. The Baby Care Centers can be a great option because they are clean, air conditioned, have some seating, private rooms, sink, microwave and changing tables. Use positive reinforcement. Using rules attached to positive things like Tinker Bell gifts or an afternoon treat can often work the best. Want to learn more about how to avoid meltdowns at Disney World? 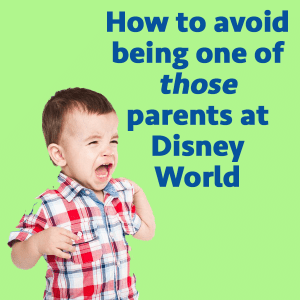 Check out the WDW Prep to Go podcast episode #116 - How to avoid being one of those parents for lots more tips and suggestions. Although this site is all about planning, it's really important to be flexible. Your toddler wants to ride Buzz Lightyear over and over again? Do it! Have a tot that really likes parades? See them all! That's the benefit of having a trip focused around them: you can do the things they like to do. There are touring plans for each of the parks below which include the use of FastPass+. The FastPass+ system is a bit of a challenge for people with toddlers because it's hard to know what they will want to do before your trip. The plans below include all of the attractions that most toddlers will enjoy, as well as suggestions for which FastPass+ reservations to get. 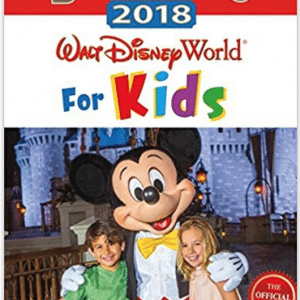 FYI - if your child is over the age of 3, they will need their own Walt Disney World ticket. Children under the age of the 3 do not. Magic Kingdom is tot mecca! So much for them to do and this is the perfect age to do it. With the addition of Frozen Ever After, a meeting spot for Anna and Elsa, and other fun attractions, Epcot has become increasingly toddler-friendly in the last few years. Check out the plan below for the best way to cover it all with little ones. Hollywood Studios is the hardest park to plan because of all of the show times, but it does have several toddler-friendly things to do. With so many animal attractions, great shows, and some interesting rides, Animal Kingdom can be an amazing place to visit with little ones. Check out the touring plan below which incorporates the new family-friendly Pandora attraction. Chef Mickey's - located in The Contemporary, this buffet character meal is just pure fun. The fact that you get there by monorail makes it even better. Beaches and Cream Soda Shop - located in The Beach Club, just outside the International Gateway entrance/exit at Epcot, this place offers cheeseburgers and ice cream, always a hit with little ones. Whispering Canyon Cafe is located at The Wilderness Lodge and serves down-home style food and a rowdy atmosphere. Ask for some ketchup and see what happens! The T-Rex Cafe Restaurant is located in Disney Springs and is perfect for a dinosaur-loving tot. Some of the dining options listed above are character meals. Be sure to check out an overview of all Disney World character meals for even more info on all options for your trip. 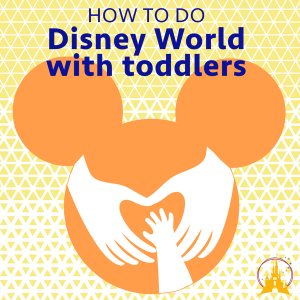 WDW Prep members have lots of features that come in handy for people doing Disney World with toddlers. Level 2 WDW Prep Members can use the dining tool to filter by restaurants that are good for little ones. The touring plans for little ones are built in to the touring tool. And as you build your touring plans, they are grouped by hour (for the first 3 hours) and then your whole plan is plotted on a map at the bottom of the page so you can see how it all lays out. I think whether or not to take your toddler depends a lot on your toddler. I took my daughter when she was almost three and she did fabulous. My son at the same age was not so great. Everything I read about taking a toddler said get to the park when it opens…this didn’t work for my son, who is (thankfully) an awesome sleeper. A more relaxed pace in the mornings would have been better for him. 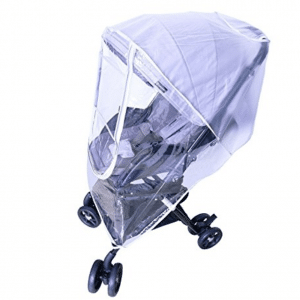 We rented a great stroller (rain cover is a must, and if you have to park it somewhere go ahead and cover it because it could rain while you are doing other things) and a full size crib from Kingdom Strollers. The crib was a godsend for my son. We set it up just like his bed at home (music box and all) and he would go right to sleep. If your toddler thrives on routine, might be best to hold off on Disney until they’re a little older and can go with the flow a little more. Just my two cents, having one easy toddler and one a bit more challenging. Would love to hear what yah think the best moderate resort is for a toddler. We are planning a trip in December with our almost 4 year old and 18 month old. We will be at the parks 4 days. Should we do a day at each park or no go to Epcot and go to Magic Kingdom 2 days? Any special recommendations for traveling this Spring Break? Heard it will be busier than usual since it coincides with Easter. We will be there from April 8 to 18 (10 days), and purchased base 6-day tickets. We are traveling with two boys (5 yr & 3 yr). The plan is to do MK 3 days, and one each of the other parks. Should we go to parks on Weekdays only? Or should we expect them to be crowded at all times? I was thinking to do Epcot and Animal Kingdom during weekends since you mentioned they are either not toddler friendly, or short visits. Shannon, this article is a little old. Now that Epcot has Frozen Ever After and lots of things are closed at Hollywood Studios, would you change your recommendations? My 3-year-old will be bored by shows at HS so we were thinking 2 days at MK and one at Epcot. Yes, we will be updating lots of content over the next couple of months, including this post. Looking forward to the update. I am headed there with my 4.5 year old in early June. We have tickets for 4 days so I am trying to decide how to do the breakdown of park visits based on things she would be interested in! Any chance your Epcot vs. Hollywood studios recommendations will be ready soon? (This is Mommy’s first trip to Disney as well so I have no idea what I’m doing or how long it will take to get places!) We get into down around noon on a Friday and have dinner reservations at the Backyard BBQ in Fort Wilderness that evening (5:30) – any chance we could hit a park before that for a “short day” option? Unsure of travel times. Also will resort hotels hang onto bags if we get there before check in time? I don’t think a toddler would enjoy Haunted Mansion. Also, I am pretty sure a toddler should not go on Barnstormer or Seven Dwarves Mine Train but please correct me as I have not ridden/seen those rides before. I thought they were roller coasters basically? How would a toddler be safe? Thanks! Going in May with a 2-year-old. Yep, many kids do those attractions, including mine when they were toddlers. Barnstormer is a coaster designed specifically for little kids. Haunted Mansion is fine as long as kids can handle the dark. Seven Dwarfs Mine Train is kind of a medium-intensity coaster that will depend on the child. Just have to decide what will work best for your little one. We did Seven Dwarfs Mine Train with our two oldest children, who were 4.5 and 2.5 at the time. Our 4.5yo tends to be more sensitive and hesitant, but he loved it. The first time in the line, our 2.5yo balked at the coaster and decided not to go, but as soon as the train left without her, she demanded to get on it! Which was tricky since the line was 70+ minutes long. We picked up an extra FastPass later in the day, and she ended up riding it a couple times during our trip and loving it! Depends on the kid, but it’s a pretty kid-friendly attraction. Wow, this is amazing and incredibly helpful for an organized freak like me. I am heading to WDW with my 4 yr old son & 2 yr old daughter. We will be staying with family in Orlando, but I plan on doing two days at MK and 1 day at HS. Any extra tips for a single mom? I am just curious as to why you recommend not using the fast pass on some rides??? I guessing it’s because you will waste it on a ride that you may be able to get on early if you follow his recommendations then use the FP for peak times at those popular rides. Hey! This is a great post! We are going to WDW in the fall. We’ve planning on 2 MK days, 1 HS day and a “rest day” where we will go to chef Mickey and the Halloween parade. My LO’s will be turning 3 and 5 during our trip. So are we missing out not going to AK? We plan on going back in 2 years with my third child, but just want to make sure we don’t miss the really fun stuff during this trip. I used this website when planning our first “family” trip to disney last year. My husband and I have both been many times growing up but now with kiddos of our own it’s a whole different experience. Last year we took our 22 month old son for the first time. We had a fantastic time, he loved it! I used your toddler tips to plan the whole trip and it was great advice, thank you! We are expecting baby #2, and planning our second “family” trip to Disney. This time my son will be just shy of 3 and baby #2 will be 6 months old. Do you have any advice on the best things that can be done with an infant, as a family? Also — which rides have restrictions on babies riding vs which rides can we take 6mo old baby on? There’s very little a 6 month old can’t do that you’re 22 month couldn’t do when you went. Except the few rides the 22 month old was just talk enough for. My son is 21 months and can only ride 2-3 rides he couldn’t before. Basically any ride without a height requirement can take a baby of any age. We took our son to Disneyland when he was 8 weeks old. And he rode everything he still rides today (minus those 2-3 he’s now tall enough for). Hi Meghan! My family and I are going to Disney this month! My daughter will be 22 months as well. What park/attractions did your son enjoy the most? Any advice on taking an energetic almost 2 year old to Disney? Thanks in advance for any info! We are doing 5 days in the parks; 2 MK, 1 AK, 1HS, and 1 EP. Would you split up the MK days or do them back to back? Also, your daily itinerary above is 1 days per park, correct? Do you have an itinerary for day 2 at MK? Thanks so much! You’re a lifesaver! This is the second time I am planning my Disney World trip using this guide!!! Thank you!!! Thank you so much for this post. I’ve been to Orlando many times (since I have a timeshare there) and it’s always been with my eldest son (who is now 20) and my nephews. I last visited in 2013 with a 1 year old and 6 month old. The bigger kids got to enjoy the parks while my babies just rode around in their little buggies. I’ve decided to take them again this year without the bigger kids (well they’re in college now) and just enjoy watching them truly enjoy themselves. They will be 4 and soon to be 3. I was looking for the right parks to go to and things to do that will ensure they have an awesome time. Your post has been extremely helpful. I was debating whether to stay at one of the themed hotels or just to stay at my timeshare again. I was initially looking at the Nick Hotel but saw some recent reviews that weren’t so favorable. Would you suggest staying at one of the Disney Hotels or perhaps my condo at Mystic Dunes Resort will suffice? I have to disagree about Epcot. We took our daughter there at 16 months and 2 years and she LOVED it! All those musical performances were what she enjoyed the most and as a 2-year old she loved visiting the Kidcot stations for coloring. The boat ride in Mexico is wonderfully kid-friendly and the Biergarten restaurant was a place she could get up and dance to the performance while the adults sat and enjoyed our meal. In fact, in the 3 trips we’ve taken to Disney since she was born we haven’t even made it to Hollywood Studios yet! In my opinion that would be the least toddler-friendly with few rides and performances that require an active child to sit and watch. We barely made it through Country Bear Jamboree at Magic Kingdom, her attention span just wasn’t long enough for sit-down performances. Maybe next year though! Hollywood studios is a must see for toddlers simply because of the Disney Jr. Show! And of course the character breakfast (also Disney Jr.) at Hollywood and Vine. My then almost 2 and 4 year old LOVED it! We are going again when they will be 3.5 and 5.5 with a 6 mo. old and we are definitely going the breakfast again as it might have been the highlight of the trip. I highly recommend that you take your toddler there. They also appear at lunch AND you can get the Fantasmic dining package at lunch so it’s a great deal – food, characters, and great Fantasmic seating. Is the food good during lunch? I have been going to Disney for my entire life and I always felt disappointed at lunch/dinner brunches. You’re thoughts? Also, is the fantasmic dining package worth it for a 5, 3 and 6 month old? I’ve never done it but would be totally game if it’s age appropriate. You mentioned some Animal Kingdom attractions on that list (Nemo musical and Triceratop Spin). The things that seem to appeal to people at HS right now include the Frozen Sing-Along, Disney Jr. characters (the only park where you can meet them), and now the new Star Wars stuff. I am re-reading this in preparation for our trip this fall (after a trip in January) with a 5.5 and almost-3 year old. Our girls loved Epcot. It’s a must for any toddler princess-lover. Where else can adults have a beer while waiting in line to see a princess? My then almost-5 year old LOVED visiting Epcot in afternoons while her 2 year old sister napped – it was a great place to hop after a busy morning at MK (even on low-crowd days, MK gets too busy for our tastes after about 1 PM). We are actually disappointed to lose that easy option this year as we are staying at a monorail hotel rather than the Swan. Hi, I am coming to Disney World in late Oct on a one day park hopper ticket with my 11 year old (not an avid rider) and my almost 3 year old. How would you suggest I break down my day and what attractions would warrant the FP? I wish I could afford more but this is a once in a lifetime for us! We did Disneyworld last year for the Food & Wine Festival with a 5 month old and we’ll be going back this fall for f&w. Our baby will be 18 months so I’ve been Googling things to do with her. I’m sure it will be mostly the same rides/activities we did last time but she can walk now and actually play on the resort playgrounds, etc… We’re so excited! Thanks for outlining some of the rides/activities. Helps me figure out what we missed last time and what we are actually able to do with her this time. Shannon, love the site. Thanks 🙂 I’m planning a Disney World trip with my daughter, who will almost three, and my son, who will be 1 and a half (he’s only 10 months now). Any suggestions about what to do on the off day when we are not at the parks? We will be staying on Disney property. Rest! Walk around your resort and take pictures, go to the pools and playground, spend extra time in the gift shop and food court. You will love having one day that you don’t have to rush for a fast pass or dining reservation. Plus, if your trip is like mine, you’ll be exhausted! 🙂 Have a magical time!!! Thank you so much. I’m an Orlando native and still find Disney overwhelming. Taking my 3 kids in June, ages 4, 2 and 6 months. I just booked our first wdw as a family for beginning of december. My daughter will be 14 months and I am nervous. These suggestions all seem centered around 2+ years old. We love characters and love everything disney has to offer but are wondering if at 1 a child recognizes the characters or anything like that. We arent so concerned about the rides as we are about transportation with her. She is a great baby and super patient. But we dont know what she will be like in 7 months. Any travel suggestions? You all will have so much fun at Disney! We took my daughter for her 1st birthday last year and had a great time. We only did Magic Kingdom because it seems to be the most toddler-friendly. The day before we went there, I made a daily schedule of the rides based on wait times at different points during the day. It was the best thing I could have done! We waited a max. of 10 minutes for a ride all day. We went back to our hotel after lunch for a nap and came back around 4pm to see some parades and go on more rides. Our daughter did great and enjoyed every minute of it! Thanks for this awesome info! We are taking our sons for their first WDW experience in late October. They will be 3.5 and 1 at the time. We are only doing two days of MK with a pool day between. I’m especially interested in the way that you were able to look at the wait times the day before. Can you talk about where you found that info and maybe even how you strategized? Hi Amanda, where did you find your info to plan around the wait times? We took our son the week after his first birthday and he loved everything! It’s by far my favorite trip we’ve been on. He knew his characters well from the toys and watching MMCLUBHOUSE. He really enjoyed the parades too along with the rides which they can do nearly everything but the big ones on your lap. Yall will have a great time. I think your babe will love it! Our 5 month old loved it so much we’re taking her back at 18 months this fall. She 100% recognizes Minnie Mouse (because of all her Minnie toys) and she love love loves looking at pictures of our last trip. Just this morning she pulled our family picture from epcot off the fridge and walked around the house with it. She’s only 12 months (13 months on June 3rd)… lol. Just want to say thank you! Our trip is almost entirely planned around your suggestions… I would have been so lost without this post. Thank you so much I am taking my 2 year old and I want this trip to be all about her. This really help me so much thank you. Hello! We are leaving soon for our second Disney World vacation. We have a 2 year old and I am wondering if on top of rider swap we can go through the queue as a family and have the little guy and a parent exit before the ride. That way he can still enjoy the big kid rides. Hi! Fantastic website, thank you! Have a quick question – we are taking my 3 year old and 1 year old to Disney in about 2 weeks. We missed out on getting FastPasses for Anna/Elsa and the Mine Train Ride (boo! but that’s what happens when you go rather last minute, right?). Anyway, I am looking for advice on how to still fit those into our schedule without waiting in line for hours. For our time at MK, we have allotted — Wednesday afternoon (we arrive around lunchtime), Thursday morning (extra magic hour at MK that morning) and all day Friday. I was thinking we could just get there early on Thurs/Friday mornings and beeline it for those attractions. Am I being naive? Any tips? Total Disney novice here. I haven’t been in nearly 20 years . . . we are SUPER EXCITED! 🙂 Thanks for your advice! Getting to parks at rope drop can be helpful for those two hard to get rides. Also, keep checking even up to the day you arrive to see if those fastpasses open up. We were lucky and got 2 Mine Train FP about a week before we were scheduled to arrive. Also, character lines tend to be lower during parades and later in the evening if you can get your little ones to nap and stay up a bit later. Being that you are going off season, hopefully that will help too. Sending you some pixie dust that something opens before you go, just keep checking. We are planning a trip to Disney with our 4 year old (first time for her!). I really love all your posts and suggestions, especially for traveling with little ones and the crowd calendar. In particular, your you tube recommendation was a great one! My LO has been raving about Seven Dwarfs Mine Train, but when we watched the videos it totally freaked her out. Knowing now that she is unlikely to want to ride has saved me one of my precious FastPass options. I do have a few questions that I would love input for: First, we are staying for 6 days (5 day park hopper pass), and I am definately committing 1 full day to MK and 1 full day to Disney Studios. I am planning to split two of the other days between MK and Epcot. My husband and I really like Epcot for dining and we are doing the Princess Hall breakfast in Epcot one morning. Are there any good websites/apps/maps/guides we should get now or when we arrive to locate the Princesses in World Showcase? (LO loves the princesses). Second, I am thinking about skipping AK completely given my LO’s age. It seems to me that AK doesn’t have that much to offer a LO (especially one that’s not really into dinosaurs) and that we might do better spending the time in another park or at the pool. Thoughts here? Third, any recommendations for guides/apps/websites on princess meet-n-greets? In particular, I have heard Merida is hard to get. Also, is AK the only place that Pocohantas appears? Lastly, since I haven’t been to WDW in some time, can you make any suggestions about how much time I should estimate for travel between parks? Right now, we are planning on using only the WDW transportation system (buses) and not renting a car (just not in the budget!). We will be visiting this Spring (but after Spring break rush) and staying in Art of Animation Resort. Since I expect to spend the bulk of our time in Epcot and MK, any estimates on travel time from the Resort to those parks would be much appreciated. Thanks again for all the great recommendations and advice! You have been a big help in my planning! I just wanted to say that we recently returned from a trip with our son, not quite 4. He loved Animal Kingdom. He is not a big fan of dinosaurs either, but he loved the train ride, Rafiki’s planet watch area with a petting zoo, and his favorite of our entire Disney world trip was the Safari. It may be worth stopping in Animal Kingdom just for a few hours one morning. The safari, Nemo stage show, and A Bugs Life 3d show are also great for her age, and Tusker House has a great character breakfast as well. Just some thoughts. Its a great park!! Animal Kingdom is actually a great park for little ones. So much fun for them there. Lots of great characters, the Kilimanjaro Safari is awesome, The Tusker House is fun with Mickey & friends, The Festival of the Lion King and The Flights of Wonder (bird) Show are both beautiful. Also, there is Rafiki’s Planet watch with a train ride over and animals to pet. Then there is a spot where kids can dig out a huge dinosaur fossil in the sand. Mine loved that even though they weren’t crazy about dinosaurs. Thank you so much for all this information! We are taking my 3 year old to Disney end of April 2015. We are not staying onsite which I regret, but is already a done deal. We fly in on a Friday afternoon and leave on the following Wednesday early evening. One day will be committed to Universal Studios (without our son). So with traveling, we only have 3 days at Disney. We were thinking one day at MK, one day at Animal Kingdom and one day at Hollywood Studios. Is it worth buying tickets ahead of time? Should we do two days at MK, and skip Hollywood Studios? I feel pretty overwhelmed. I am going to skip park hopper since I do think it will be too much for our son (and my parents who are coming with us). For dining, we weren’t going to plan anything ahead of time since we will probably do quick stops to eat. As for fast pass, since we are not staying onsite, it appears I can only reserve them 30 days in advance, so I will tackle that at that time. Thanks again for any advice! We are also heading to Disney around that same time for our second trip. I have 3 year old twins and a 2 year old. My girls LOVED Hollywood studios- this is where you can meet the Disney Junior characters as well as see Disney Junior Live. I think its a pretty pre-school friendly park. We usually use our park hopper option because we take a break for a few hours at our hotel before heading back out- sometimes to the same park but usually to a different park, but we usually stay onsite somewhere on the monorail line to make this going from the parks to hotel and back more convenient. It might not be worthwhile since you are staying offsite. The only advantage to buying your tickets ahead of time is you get to make your fast pass selections. Also, I would really consider making at least one character dining reservation- it was definitely one of my girls favorite parts- they particularly enjoyed Hollywood and Vine at Hollywood Studios (it has Jake, Sophia, Doc McStuffins, and Handy Manny) but this time we will be trying Chef Mickeys since it comes highly recommended. Most of all- don’t stress and use the resources to make a plan before getting to the park, its pretty overwhelming without a plan since there are so many options. I loved reading this! We are taking our little lady to Disney World for the first time next Christmas (2015/2016) and she will be 13.5 months at the time. We are huge WDW fans (DVC members and AP most years) but we haven’t been with a little one since we were little ourselves, so I am so looking forward to it. 1. Use the My Experience app online or mobile to determine which characters are available at each park and rank them according to who your child wants to meet the most. Set up Fast Passes if and when you can. 2. Arrive at the park before it opens and snag a times guide. That times guide will have the character greetings schedules. 3. Be at the character spot ready to line up at least 20-30 minutes before that character is scheduled to appear. Otherwise it will be very difficult to meet all the characters you want to meet. I wish I had known beforehand how important this was going to be to my 5YO. She didn’t end up wanting to do many rides, but she did want to fill her autograph book. Missing Merida and Pocahontas (Pocahontas is really tough to get, people) was a huge let down for us. We will put them at the top of our list for our next visit! Thank you so much for this post! We are planning a Disney vacation for July 2015 and I am sooooo excited! I feel like I am living vicariously through the kids (who will be 6 & 7 by the time of the trip) since I’ve never been and I’ve always wanted to go! We live in NJ, and we may actually drive down because its way cheaper with a family of 4, so unfortunately we will most likely be at the parks M-F (I’ll keep checking plane tickets though, if we can keep the budget low for the flights we will much rather take that option!). Your breakdown of what places are best for young children REALLY helps (they obviously won’t be toddlers, but I think some of the same rules still apply)! As much as I want to see Epcot (and I really, really do LOL), I know the trip is mostly for the kids so we’ll probably skip it this time around- but we’ll be back. I’ve been leaning towards Art of Animation since the Disney themed rooms will really resonate with the kids, and your co-sign just confirmed it! I am still on the fence of telling the kids at Christmas because the count down would be wayyyy too far, I can just imagine their delight as we pull into Orlando and see the Magic Kingdom castle, or pack their bags and tell them- we are going to Disney- NOW! Awesome!!! Do NOT miss Epcot; despite what the author says Epcot is far too unique and interesting to miss. Your kids will love it. I second this, Epcot is not to be missed. Bellow is a list of attractions I think your kids, and the grownups as well, would really enjoy, in case you find that helpful. 1. Ellen’s Energy Adventure – This is a must for kids, there is a section where you travel through a fantastical world of dinosaurs and I remember as a kid feeling as if I were really riding through the Cretaceous period. The video is a bit hokey but kids that age should still enjoy it. 2. Journey into Imagination – While this may be a bit like a bad trip, it’s also really fun, brightly colored and has almost no line. This was another fave of ours growing up, although it’s changed since then. 3. Soarin – The average 6 year old is 42 inches and the ride restriction here is 40”, so I’m gonna say that this is worth the trip to Epcot alone as all the kids who come off this ride leave with their jaws hanging open. *** Tip: If case you didn’t already know, Epcot has a tier system for FP+, this is up there with Test Track and Mission to Mars in Tier one and you can only book one of the three in this category. Neither of the other two rides book up like Soarin though or get the ridiculous standy lines Soarin does. If you want to ride this ride you MUST get the FP+, preferable well in advance of your stay. Then you can ride the other rides on standby at a time when there are shorter lines, such as park opening. 4. Test Track – Again at only 40” restriction your kids should be able to ride. 5. Spaceship Earth – I think this ride is mandatory when you go to Epcot, like they won’t let you leave if you don’t ride it. That said, this was a fave of the family kids growing up and we still love riding it today. After you’ve done that there are of course many other rides that kids might like, such as living with the land or the seas with Nemo and friends. Then, there is World Showcase which really is not to be missed. If you don’t think your kids would automatically enjoy it, consider doing what my folks did, telling them about all the countries you will visit while you’re there. Discuss the “cool history” of one country at a time and tell them they will get to visit it while in Epcot. I remember my dad told us all about Samurais and we watched a movie about them so when we got to the Japan Pavilion my brother and I spent hours pretending to be Samurai warriors and running around. Yes, there is a lot more to Japan than Samurai, but to kids, that is the cool history lol. Each country has something similar. Still, even if they aren’t into it, at the very least they will be into the Pizza in Italy which is amazing and the ice cream in France which is also fantastic. Also, a lot of the countries have shows at regular intervals, if your kids like that sort of thing then this is another fantastic opportunity to get them into it. As far as accommodations go, with a family of 4 it’s often easier to stay at a resort with a kitchen or at least a kitchenette. The Art of Animation is a great choice but so are the Deluxe Villa Resorts. Now, I know what you’re saying, they are expensive and yeah, if you book through DisneyWorld.com you bet they are. However, if you book via dvcrequest (dot) com you get to rent points from DVC members who don’t want them/can’t use them (who these people are I have no idea as we use all our points and then some). We have used them in the past and they are outstanding. I would recommend Animal Kingdom Lodge, they are the most affordable and yet, in my opinion, have the best staff, food and amenities on property. The only down side is that they are further than the other resorts, but if you were staying at Art of Animation, that was already the area you were in to begin with. As a point of comparison, for July 6-10 A Standard View 1 bedroom at AKL is $1790 and a suite at Art of Animation is $1650. Hope this was helpful and that you have a fantastic trip!! I took my 3 1/2 year old to Epcot and she loved the seas with Nemo and friends ride so much we did it 3 times in a row. She also loved turtle talk with Crush and there were some crafts she was thrilled with (and they didn’t cost me anything extra-Kidcot Fun Stops). I don’t think it’s a bad idea to bring younger kids to Epcot. If you have the time do it. There is also lots to see at the Epcot World Showcase and we ended up seeing some characters. I think this next time around we’ll do the Epcot World Showcase Passport kit. I might suggest making Epcot one of the first parks you go to because once they get a whiff of Magic Kingdom it might take a little more effort to entertain the young kids Epcot for an extended period of time. 1) Start the day at MK and use Fast passes there for the attractions we really want to do. Head to AK for lunch and attempt to get a Fast Pass for the safari when we arrive. 2) Start the day at AK (it’s a morning extra magic hour day). Get in all we can by using stand by lines. Head to MK in the afternoon and have our 3 Fast Pass + reservations for late afternoon/early evening times. *I should add we are going during one of the busiest times of year. It all depends on which attractions you want to hit in both parks, and I’m assuming you have other day(s) planned at MK too? Not knowing the specifics, I would suggest you hit AK early (EMH is even better!) and work your way through that park all morning while it’s cooler and less crowded. AK is the easiest park to do without FPs, in my opinion. Finish the morning at Tusker (possibly even looking for a slightly earlier ADR, but the time you have will also work). Then head to MK where your FPs will be waiting for you so the crowds aren’t such a big deal. If you want any of the major headliners like Anna & Elsa or 7 Dwarfs MT then definitely FP these if you can. If you do NOT have at least one other full day planned for MK, I would strongly suggest you reconsider, as a few hours won’t get you far in that park, there are way too many fun things to see! 🙂 Have a great trip! So exciting! I’m just pregnant now but I’m trying to get some family vacation ideas in mind when baby is about 2-3, I really appreciate this article! It’s really hard to tell people how they should spend their days but you gave such a nice idea that you can adjust based on your family. Thanks for the tips. We used this page to plan the trip we took last week. We loved Epcot with our toddler (27 months) and could have stayed longer. There is so much to do between the rides, playgrounds, aquarium and Innoventions. My thoughts: Maelstrom is overrated and very short – I wouldn’t waste a FP+ on it if you would rather rider-switch some of the “adult” rides that typically have longer lines. Just my two cents. Thanks again for your dedication! I heard your podcast about flying to Disney but wasn’t sure if renting a car seat from the airline is a good idea or should we just bring our own? Thanks so much for the tips! I used a lot of them and we had a great trip. We just returned with our three kids yesterday. Is Mickey’s Jammin Jungle Parade no longer happening after June? Correct. It’s going away at some point in June. Oops I meant kids not kudos…. Darn autocorrect. We are planning our trip for the last week of October 2014. My daughter is 6, my son 4. We initially planned for 2 days at Magic Kingdom, 2 days at Epcot, 1 day at Hollywood Studios, and 1 day at Animal Kingdom. Now after all the research, I am contemplating doing just 1 day at Epcot and 3 days at Magic. We will not be doing any of the Water Parks. 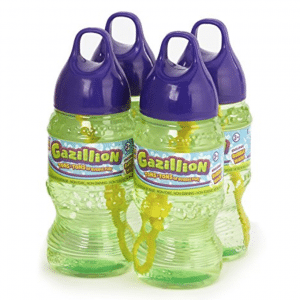 What would you recommend for a 6 and 4 year old? Why don’t you leave one day open and just figure the park on the day of…. If you feel like you need more MK, you can go there but if you feel like you still have a lot of ground to cover at Epcot and your kudos enjoyed it…. do that instead. Also, you may want more downtime or consider doing MNSSHP and taking a morning off. I would probably cut Epcot down to 1 day and add a 3rd at MK if I were you. We had 8 days in the parks with our 4- and 2-year-olds in Dec 2012, and we spent 4 of those at MK! And the kids would have been thrilled with even more MK time. Just like Shannon says, they liked Epcot OK, but it was probably their least favorite park. Hollywood Studios was probably their second least favorite, just because they kept wanting to ride rides and there’s just not much there in that department. But they did love the shows and characters. But with small kids, half the vacation in the MK is not crazy; it’s probably the best plan. My family is going on our first Disney World vacation at the end of this month (my first time as well…I’m 35!). As overwhelming as it is in planning it, your website has been so helpful in simplifying it (if that’s possible). I had a couple of questions…we will be there 4/27-5/3. Do you think they’ll allow any riders on the Seven Dwarf’s Mine Train before the official opening date? Also, when Anna and Elsa moved to MK, it opened up one of my fast pass options as I had the ones they replaced as a fastpass option. I can’t figure out how to use my one extra fast pass without having to redo all of the others. I’m afraid I’ll lose my meet time with Anna and Elsa. Any ideas or suggestions? Thanks! This might be a silly question, but if you’re making fastpass reservations online for a family that has toddlers and big kids, can you get different fastpass reservations for different members of the family? I’m sure we’ll want/need to split up some to make everyone happy. Yes, you can customize. You’ll likely have to book everybody as a group initially and then you can go in to individual reservations and modify as necessary. It’s hard to come up with 3 FP+ to get at Epcot but the My Disney Experience system requires you to pick 3 so it’s on the list. We actually have run in to lines there occasionally but I really think the FP+ is only necessary during a peak travel time. Great information as always Shannon! Do you think the updates to Fast Pass + which will allow more than 3 fast passes, and the ability to use them at different parks be updated by July or August of 2014? Excellent suggestions. I wish that someone would have written this two years a go. My parents, my brother, his wife, their kids, some friends of theirs with their kids, & I went to Disney. We took them to Animal Kingdom one day. We went on one of my favorite rides “Dinosaur.” My eldest nephew was 4 at the time & big enough to ride it. He really loves dinosaurs but, really freaked out that the ride was totally in the dark & extremely bumpy (not to mention also that the Carnatorus looks like it’s going to eat you.) He’s now 6 but, I’m still a bit hesitant to suggest that we go on that ride. We went to most of the other parks too (except for Hollywood Studios.) He wanted to go on Test Track but was to little (back then in height) to go on. Maybe the next time that we go he’ll be able to go on it. Thank you so much for this article. We are traveling to wdw soon with our 4 year old and toddler. We are staying 6 nights Sunday-Saturday. We have 5 days of passes so my question is would it be better to save Sunday and Saturday when we are traveling for just settling in, swimming, exploring downtown disney and doing 5 days in a row at the parks M-F? Or should we try to fit in a park the day we are flying in or leaving in order to get a rest day mid-week? Any advice on this would be appreciated. This is a bit tricky. It depends on ur kids. Some kids don’t mind going to the park one day & then the next day going to Downtown Disney. Other kids might not like that idea. What I did once with my parents & my nephew (who was 3 almost 4 at that time) we did part of a park (Magic Kingdom) in the morning, went to the hotel pool in the afternoon, & then Downtown Disney at night. He did also take a nap after lunch. Plus, he’s a well behaved kid. So, if I were you I would split your time to the best of ur ability. One day (or part of the day) at one park, the afternoon at the hotels pool (or any other recreation that the hotel provides), then Downtown Disney at night time. I think that all (if not some) of the hotels provided baby siting services. So, u can go just with your husband/wife to Downtown Disney alone. I keep trying to print these plans, but they come out really small. Any advice? Hi, this blog post was fantastic. Very detailed. Disney should pay you! I am trying to plan a family vacation and when we go my son will just turn 2 years. How old was your toddler when you made this trip? I think there’s a vast difference between a 2 year old and a 3 year old. Would you suggest Disney for a 2 year old? My son was 3 1/2 on his first trip but our 2 1/2 year old nephew was with us and did well. I think it kind of just depends on the kid. I totally agree. It can depend on the child & also how the parents and/or other adults are around the child. I’ve seen it all. From parents getting really angry at their overtired child to parents that talk to their children to see what the problem is. Just remember to be very patient, reserve ur fast pass rides a.s.a.p., have drinks/snacks with u for the kids, have naptime scheduled in somewhere, & take/rent a stroller just in case. Thanks for all this information. You have noted to send a fast pass volunteer to get a fast pass for you. Where can you find these volunteers? I am particularly referring to the safari ride in AK. And don’t forget to send that family member with ALL of the tickets of people who plan to ride! You have to feed the park ticket into the machine to make it work. I think that it’ll be a good idea to have a friend/family member help reserve the fast pass rides/times that u want/are available. That’s no longer necessary since FastPass+ reservations can all be made ahead of time. 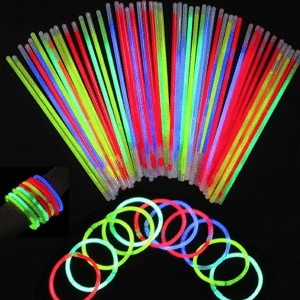 I have made note of these for traveling with small children; however, I just received the new trip planning guide in the mail for magic bands and fast pass + sign up from home. How do I go about choosing times for fast pass + based on the toddler planning guidelines? Example, if I enter MK now and Peter pan will be the 4th thing I do, how will I know what time to request with the new system? I would definitely recommend fitting in some character dining experiences with toddlers, if at all possible. The lines to meet characters can be just as long (or longer) as the most popular rides. It really gives the kids a little one on one time with characters without the stress of waiting on line. You get to take pictures and enjoy a meal. Then get back out there to enjoy rides. This worked out well for my 3 year old and 16-month old this past October. These are great tips for planning a toddler focused trip. They are so important and sweet as toddlers, and they do definitely change so fast. Thanks so much! Looking forward to your articles on Disneyland as well. Kenzie, would you share your schedule for your trip? I am planning a trip for Sept 2014 with a 4.5 and 2.5 year old and the two different ages are frustrating to plan around. Do I Plan some toddler stuff knowing my 4.5 year old might not be into those activities and vice versa? I’m in the same boat, just larger. My son is 11 and has been to WDW once, Universal once or twice and DL once. This, however, is my 4 yr old daughter’s first trip to WDW. We’re planning on spending 2 days at Magic Kingdom and one at either Hollywood Studios or EPCOT. (It’ll be 2 kids and 6 adults going.) The first day, I’m planning on us spending most of our time in Fantasyland which is pretty girly and full of stuff for the younger kids. But my son’s patience will be rewarded, because the next day is all about being a pirate in Adventureland and racing cars in Tomorrowland. I have planned back-up activities for the 4 yr old while the 11 yr old gets to ride Space mountain (the Astro Orbiter is pretty close), and the arcade is near the speedway. If she decides not to do Big Thunder Mountian, she’ll hop on the Magic Carpets. The trick is going to be to separate for one ride, then have everyone do the next thing together before we split up again so that we don’t feel disconnected on our family vacation. Good Luck! Thanks for great post. We’re heading to Disney World this coming weekend with out 2 1/2 year old….we can’t wait! I didn’t see a lot of character dining recommendations in here. (Royal Table, Akershus, etc). Do you recommend that with toddlers? If so, how would you fit that in with your suggested schedules? If you could possibly add in some suggested character meal timing I think that would certainly help me a great deal. Excellent and sound advice. I now feel more confident in our trip and am also getting a sense of excitement with a number of worries out the way. chef Mickey place at magic kingdom? Chef Mickey’s is in The Contemporary Resort, very close to the Magic Kingdom. You can get in there without a ticket. Thank you so much for this informative and reassuring article. I’ve been debating whether taking my 3 year old boy next year would be too soon for him. Although I still remember my first trip to DisneyLand at age 3. Thank you, thank you, thank you! We just got back from a 7 day trip to WDW and your plans for visiting the parks with little ones were spot on. We have a 7 yr old (non-coaster rider) and a 3 yr old, so the plans were perfect for our family. We followed them pretty closely with a few variations and they helped us have a fun, stress-free time since we knew what the plan was before we even got to the park. There was no running around, confusion, back tracking, or long waits. Thanks to these plans and all your tips, we had a magical vacation. Thanks again!!! You rock! I am currently in Orlando and extremely overwhelmed on where to take my 3 year old boys on their first Orlando trip. I am so glad I found your page. Now I have a plan. Thanks for all your hard work. I think your best advice is to remember that this trip is for the toddler. We’re planning our 2 year old’s first trip to Disney this September (free food plan!!!) and I think we’re going to spend most of our time hunting down the characters because she just LOVES them. We have the rest of her life to go on rides, see shows, etc. I will be downloading those touring plans though! Thank you! I have booked our room, character meals, extra special activities such as the NSSHP and breakfast in the castle…I did it backwards and I’m now planning our days in the specific parks around our meals. (Lesson learned!) Being that this is our family’s first time to go for all of us, I’m not sure what touring plan to use, with little ones or without little ones. My kids will be 5 and 7 when we travel which seems to fall between both touring plans. Any suggestions? I want to email our plans so far but it’s still a little unorganized! Your itinerary says that Disney, Jr. Live on Stage is closed till Feb. 15 — is that Feb 2013 or 2014? We are going Memorial Day weekend and want to see it if possible! Went in March (2013) and was open. My daughter turned 5 a month before and she is in LOVE with the Disney Jr. We watch everyday! But I have to say we were very disappointed 🙁 its a puppet show, not real life characters. All she wanted is to se Sofia the First and it was not a “real princess” just a puppet on a stick. Really??? My girls LOVE Sofia, my younger daughter’s name is Sofia too, so she’s even more in love with her. I showed them you tube videos of the show and they liked anyway (the video was with out Sofia), but do you know id this “puppet” thingy is also replied on the Hollywood & Vine Disney Jr. character breakfast too? If it is, I must prepare them so they know what to expect and don’t be disappointed. That was for 2013. It’s now open and I’ve updated the info above so it doesn’t say that anymore. I love everything about your website and tips. S UPER helpful!! Been there a gazillion times but my first time with my 3 year old. We are celebrating her birthday. Any tips? I have seen on other sites that there is a petting zoo at Animal Kingdom. My 15 month old would love that. I don’t know for sure because whn I have gone the other times it was with my nephew when he was 8 and 9 so he wanted to ride all the scary stuff. This was great info. I really appreciate you putting it all together so we can make our decision on a cruise or the park.